As the sun rose in the east on the first Monday in March, so began a day of celebration for what has become one of the most global sports in the world: Tennis. It heralded World Tennis Day, a fiesta designed not just to entertain current fans but also to attract new ones. And the reach of the day’s activities was vast: 75 countries hosting events from club to elite level; 140 countries broadcasting the three showpiece events; and 14 players who together had won 92 Grand Slams, from John McEnroe’s 1977 French Open mixed doubles to Li Na’s Australian Open five weeks ago. The Far East, then, kicked off proceedings at the BNP Paribas Showdown in Hong Kong. Big Czech Tomas Berdych, fresh from his title run in Rotterdam and final run in Dubai, jetted east to take on Aussie favourite Lleyton Hewitt, while two of the most popular names in the Asian Pacific region, Li and Sam Stosur, faced off in a women’s exhibition. It proved to be an Aussie day, as Hewitt and Stosur took the honours. In the far west, at the end of World Tennis Day, New York brought together two of the biggest rivals in today’s game, Novak Djokovic and Andy Murray, while doubles stars the Bryan Brothers took on older siblings, John and Patrick McEnroe. For what it was worth—and entertainment was the theme of the night at the famous Madison Square Garden—Djokovic beat Murray and the Bryans beat the Macs. At the midway point in the sun’s journey through this day of tennis, it passed over London, where four Grand Slam champions would replay famous encounters on British soil, not at the usual Wimbledon but indoors at Earls Court. No, no… that would be overdoing it: It would be miserable to overdo it! It’s always a challenge against Ivan. He’s one of the players I learned a lot from when I was coming through. The first real power-player of men’s tennis, I think. Cash nevertheless scored another London win. But perhaps the highlight of the entire day around the globe was the rekindling of what was, through the entire 1990s, the equivalent of today’s Roger Federer-Rafael Nadal rivalry: Andre Agassi against Pete Sampras. These two giants of the game, separated in age by just a year, played one other 34 times during their professional careers, with Sampras coming out on top in 20 of those meetings. Between them, they won 22 Majors—and Sampras’s 14 stood as the record until Federer overtook it at Wimbledon in 2009—and held the No1 ranking for 387 weeks. Sampras claimed 64 titles, Agassi 60, and the rivalry that began in 1989 continued until Sampras won his last Major in a four-set victory over Agassi at the US Open in 2002—12 years after he had claimed his first US title over Agassi on the same stage. However, the Federer-Nadal comparison goes deeper than mere numbers. 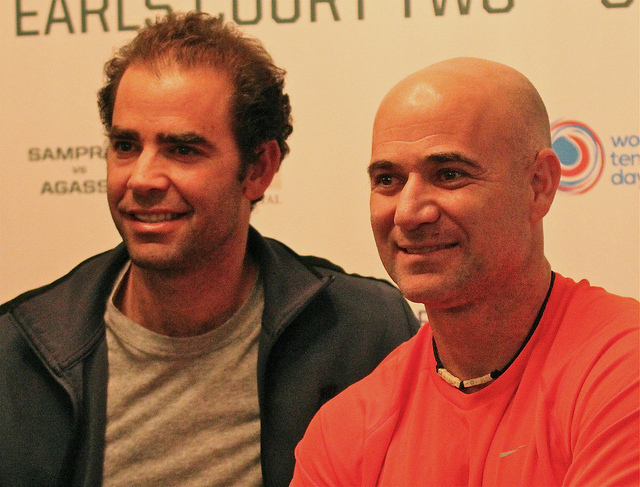 The Sampras-Agassi matches brought to court contrasting personalities and contrasting styles of tennis. Sampras epitomised the efficient cool, collected athlete, but one who played an attacking, clinical, serve-and-volley game backed up by a powerful and accurate forehand and a single-handed backhand with which he could fire a down-the-line winner or chip his way to the net. Agassi wore his heart on his sleeve, an extrovert showman, though with a less elegant style. He was the counter-puncher par excellence with one of the best returns ever to grace a tennis court, but that description does little justice to the all-court skill, speed and variety that Agassi brought with him. It was of these contrasts, and the difficulties each faced with the other’s game, that the two men talked ahead of their latest meeting in London. It was his return, his passing shots, he competed well, moved well, did everything that I didn’t like to see. And if I wasn’t on my game, if I wasn’t serving well, I thought it was going to be a love game for me. It was a tough match-up. He hit the ball well and early, so it was tough to control the court. I was doing a lot of running: If I didn’t play well, it was going to be a long day. He was the best player I played in my career—and I played a lot of good players. He was certainly a special opponent. We have been battling since I was eight years old, and 35 years later, we’re still playing. It’s quite a history. 6-1, 7-6! I was a year older so I was a foot taller. When I saw him in Indian Wells about 10 years later, I was like, now he’s 6ft 2in and has a 133 mph serve: It just doesn’t seem right! I think we were opposite kinds of players, which meant the match-up lent for an all-court kind of tennis, and one of us was trying to impose his game on the other most of the time. I feel kind of different from Pete, though: When I went on the court, not only did I have to play well but it still meant, even if I did, I had no say how the match would go. I could get my wins here or there, but he was the only guy I felt if I played my best tennis, I actually still could lose. And that feeling of not knowing what was going to happen, not feeling in my control, sometimes brought out the best in Pete but could bring out sometimes the best and worst in me, because if I pressed a little too hard, felt too much urgency too early against him, I could really find myself imploding. The match could get away in a hurry, and that’s why I always felt nervous against Pete, because I always felt that at any moment, he could just blow the match open and you never knew when it was going to happen. The good news with my game is that I was never the best athlete by a long shot. But I had some decent ball-striking ability and that really works for me at this stage. I can skip a few weeks here and there and still feel pretty good, and if everybody struggles to move a bit, ball-striking wins the day. Sampras countered, “So I’m in trouble!”, and so it proved to be. Carrying a sore shoulder, the serve-and-volley master struggled to find his first serve and made too many net and forehand errors. Agassi punished him—as he always did on a less-than-perfect ball—with some blistering, perfectly-timed strikes, and ran out the 6-3, 7-6 winner. Not that anyone really cared about the result. Here was tennis history being recreated before thousands of pairs of eyes—a little slower, a little short on rallies, the tension a little softened by years—but maybe, just maybe, it inspired a few new fans to give this most demanding, charismatic and gladiatorial of sports a try.